This is a hand held photograph captured with a point and shoot. During the ride I noticed the compositional elements lined up pretty quickly while my 2 friends rode in front of me, you can see their reflectors catching the moon light during this 15 second exposure. You can’t hand hold a 15 second exposure so I knew it would have a dream like feel to it with added blur from my unsteady hand. I literally hit the brakes as soon the idea came about and hit the shutter button as I watched them get further and further away, the camera settings were adjusted manually. Did this really happen or was it a dream??? If I didn’t have a camera there is a chance I wouldn’t be sure… . .. follow your artistic ideas even if they don’t always fall into the usual landscape photographer fair. This entry was posted on July 18, 2011 at 5:30 pm and is filed under Uncategorized. You can follow any responses to this entry through the RSS 2.0 feed. You can leave a response, or trackback from your own site. I really like it. The light of the reflectors at the bottom adds a great deal. 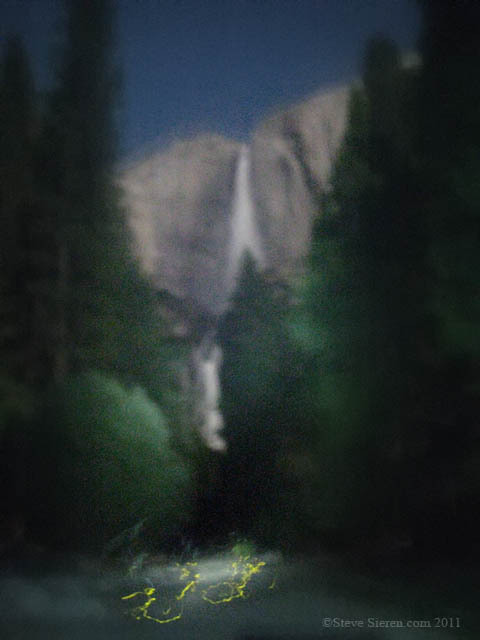 I wonder if there is some way to sharpen it just a wee bit so that it would still be fuzzy and dreamlike, but the falls and trees just a little more distinct and decipherable. What if you could mix it with a daytime image or something? I’m sure plenty of people will like it as is. I like what you did. Great example of always looking for photos and thinking outside the box. I wouldn’t have ever thought to do a 15 second handheld, especially with a compact camera. It is strangely powerful. I find it very interesting. It almost has an impressionist feel to it, or a very early photograph. Nicely done!